Once again it was necessary to escape the politics of DC and the hot and humid weather so we flew to California and Napa Valley – three nights in the Valley and one in San Francisco. What a wonderful break! If you take the crack of dawn flight you arrive at 10 am with the whole day in front of you. We chose Fox Rental cars since they had the best deal on a convertible – and with gorgeous weather predicted, a convertible seemed like the best idea. (It was.) It was glow in the dark bright blue which did mean we could never lose it in a parking lot. Our first stop on the way was the charming town of Sausalito where we wandered and asked a local woman who was sitting in an Information booth to advise on a great place for lunch. 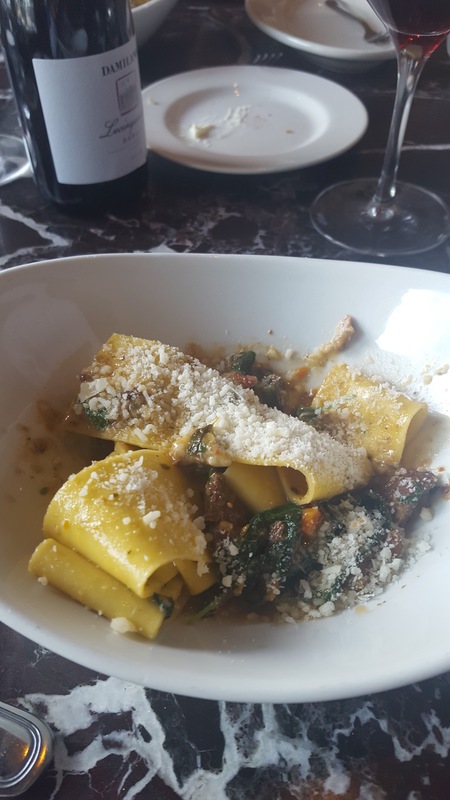 Her recommendation was Poggio Trattoria right on the main street which she said was a local favorite. It was excellent. Some of the very best food ever and the bread was mouthwatering. We had a Caesar salad and a grilled artichoke that truly were superb in addition to our pasta and risotto. From there we drove to Mount Tamalpais where we wanted to see the Redwoods in the Muir Park. Unfortunately on a Wednesday afternoon it was impossible to find a parking place within miles of the Redwoods but we did go to Muir Beach and walk around while children jumped waves and played in the dark sand. 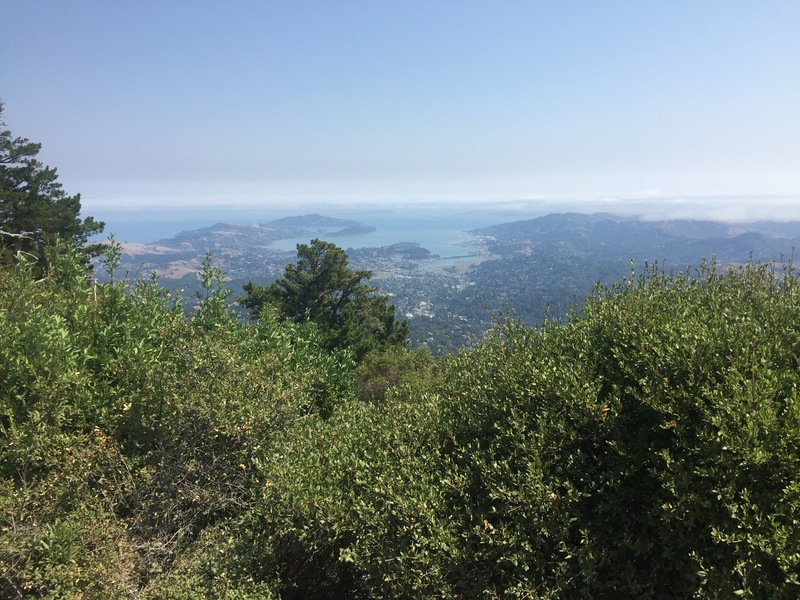 We then drove to the top of Tamalpais and what views of the hills, the Pacific, and San Francisco! From there we headed to Napa through winding roads and farming and wine country. Cows and horses in adjacent fields to rows of grapes! Dry grasses and green olive trees and vineyards. It was a great trail through the back roads all the way to Napa. We checked into the Silverado where the staff was wonderful but the facility definitely needs a facelift. Everything worked and was clean but age was making itself obvious. It did have a wonderful golf course however which looked to be in fantastic condition. Their breakfast was excellent – especially the eggs benedict. Our first evening meal was at Bistro Jeanty in Yountville. Yountville is a wonderful town with the famous French Laundry restaurant as well as their gardens and gardens and quaint houses as well as wine stores and the Laundry’s bakery which has a long line out front in the morning. Bistro Jeanty is wonderful. Traditional bistrot food in a traditional setting but it is very, very good and feels very French although the clientele are very American. We had a delicious dinner of rillettes, boeuf bourguignon, and sole meuniere. Don’t eat lunch though in order to consume all the courses you will want. 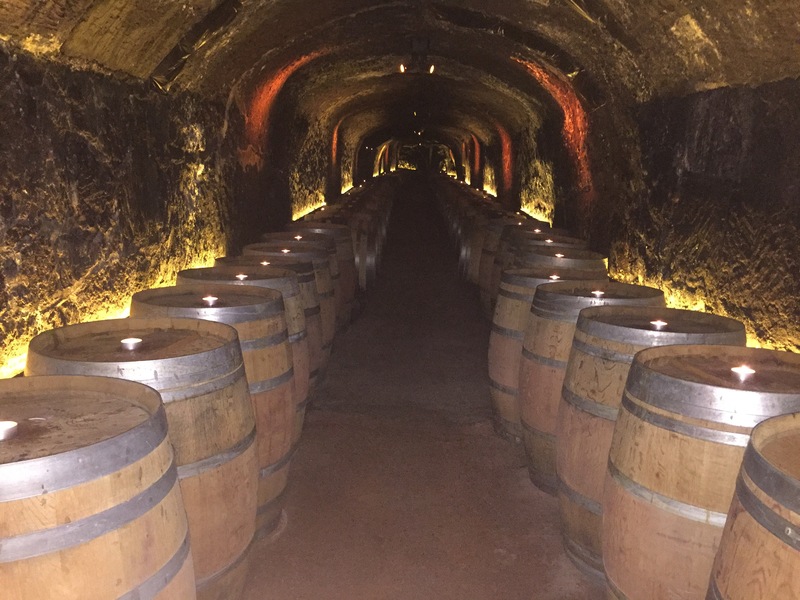 Next stop was Del Dotto and their cave which was loads of fun but I wouldn’t buy their wine. It is interesting to tour a cave, but the wine was unimpressive in my view. Next stop was Round Pond where we sat outside on a beautiful patio and were served canapés with our wine tasting. This wine was good and the I especially loved their top Cabernet. It was delightful sitting outside and perusing the vines. For lunch we went to Auberge Au Soleil which overlooks a large property and the hills all around. A perfect place for a lunch based on the food of the area and time of year. The French fries by the way are stupendous! Our favorite vineyard by far was the Beckstoffer Vineyard. In addition to Mockingbird and Amulet red wines, Semper Chardonnay and Pinot Noir, Dancing Hares and Mad Hatter (both Bordeaux blends) are available for tasting at Tuck Beckstoffer Estate in their caves daily. Contact Jessica@tbwines.com to make an appointment and you will not regret it. We have already ordered our next delivery. 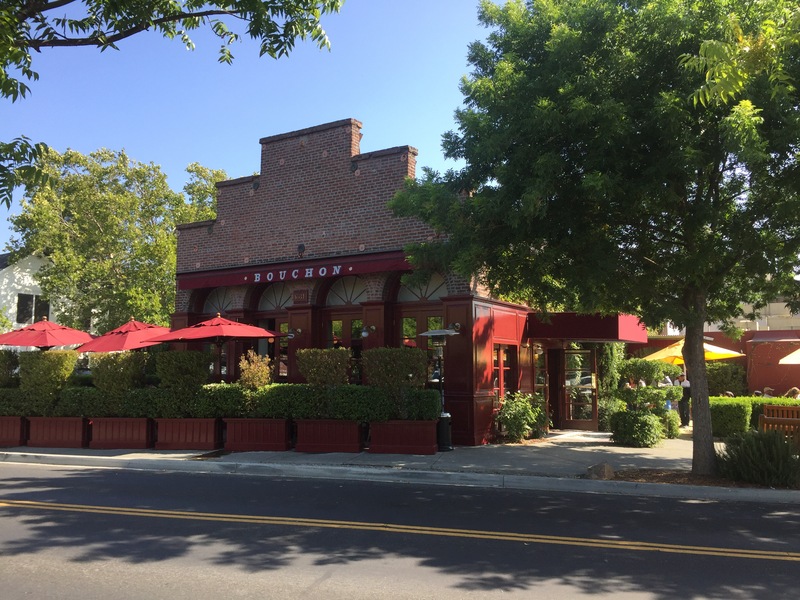 We had another amazing meal in Yountville at Bouchon, Thomas Keller’s second restaurant in the village that is more casual than French Laundry which is a tasting menu only. Bouchon is truly a step into a brasserie in Paris – the décor, the tables, the bar with 6 seats and all the art work are very traditional. We had eaten and tasted wine all day so most of us ordered appetizers and salads – and then dessert. The traditional frissee salad with croutons, lardons, and a poached egg with vinaigrette dressing was perfect. The serving of musssels had a wonderful garlic sauce, and the fresh tomato salad was truly fresh from the French Laundry Garden. One person got the steak frites and we all thoroughly enjoyed the frites. Although we shouldn’t have we ordered profiteroles (the pastry was perfect as one would assume) and the lemon tart but we loved them and managed to struggle and finish them off. 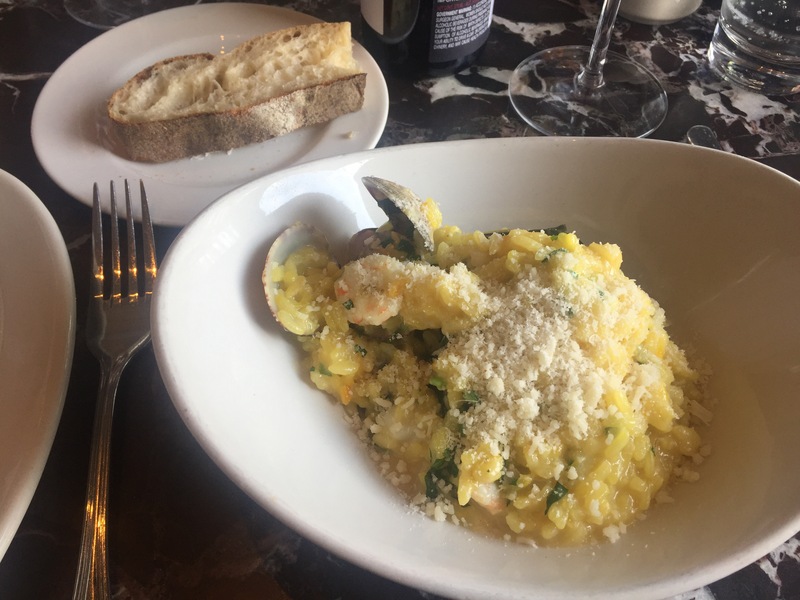 We stayed one night at The Villagio which was nice – a great location in Yountville – but it will be closed for remodeling in October – and it desperately needs it. This entry was posted in Author Commentary. Bookmark the permalink.